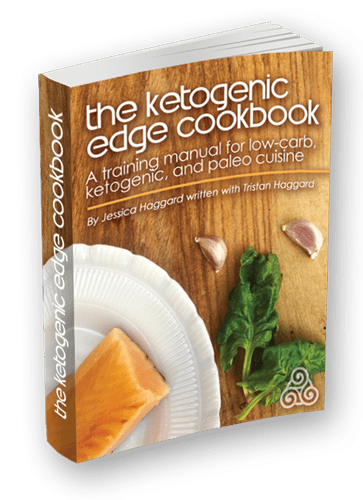 The quick and easy keto flatbread recipe from The Ketogenic Edge Cookbook is a HUGE hit! Catching up with the Savory Broccoli Muffin recipe, these flatbreads are becoming one of our most talked about recipes. I see a theme evolving here, y’all like warm bready things 😉 That’s good news because I am only a short while away from publishing our second cookbook – The Ultimate Guide to Low-Carb Baking! 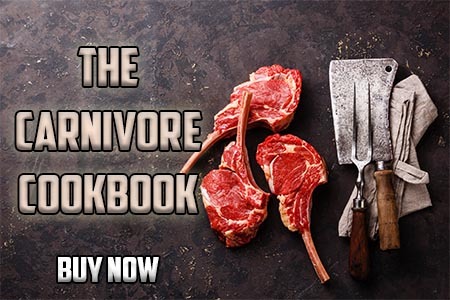 It will be complimentary to The Ketogenic Edge Cookbook and stuffed with 102 recipes for sweet and savory baked goods. There is a lot of behind the scenes work that goes into making up your own recipe. It took months of experimenting to get this low-carb, all-purpose bread substitute just right. Now people across the world can enjoy this guilt-free, fiber rich, almost zero carb keto flatbread! Thank you to all the people who have shared their ideas with us via email, instagram, and facebook. We are inspired by the many creative ideas that showcase the versatility of the Keto Flatbread recipe. I have collected the ideas here for everyone to try out. The original recipe is simple and takes only 5 ingredients. 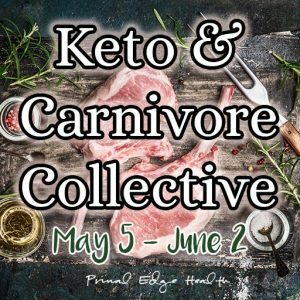 Watch the Keto Flatbred recipe video for full details. Whole chia may also be used in place of ground chia. Make a double or triple batch and freeze leftovers. They freeze well and thaw quickly. Without further ado, let’s get into the 33 variations! Serve the flatbreads warm spread with butter. topped with whipped cream and low-carb berries. Drizzled with yacon syrup and garnish with chopped almonds or hazelnuts. Wait until the frying pan is hot, then pour a large spoonful of batter in the shape of one large crepe. Cook over medium heat, watch carefully and lift at the edges as they cook. Move the crepe around a bit to make sure it doesn’t stick. Cook for a minute or two on each side. Serve with Vanilla Whipped Cream (recipe in The Ketogenic Edge Cookbook) and raspberries. Add 2 tablespoons to 1/4 cup cacao powder and 1/4 to 1/3 cup Lakanto to the batter and mix well before cooking. 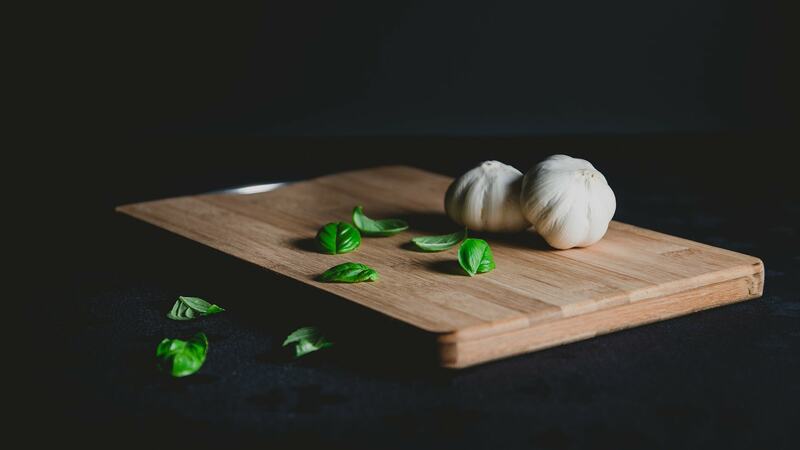 Many of our readers are cooking for multiple diet types and the Keto Flatbread serves as a great tool to nourish the whole family. Dress up a plate of flatbreads for your growing kids with seasonal fruits (banana, peaches, apples, etc), local raw honey, and a dollop of full-fat Greek yogurt or homemade coconut yogurt. Kids only need to restrict carbs if they have serious medical reasons, otherwise ample amounts of whole food carbohydrates are completely acceptable for children. 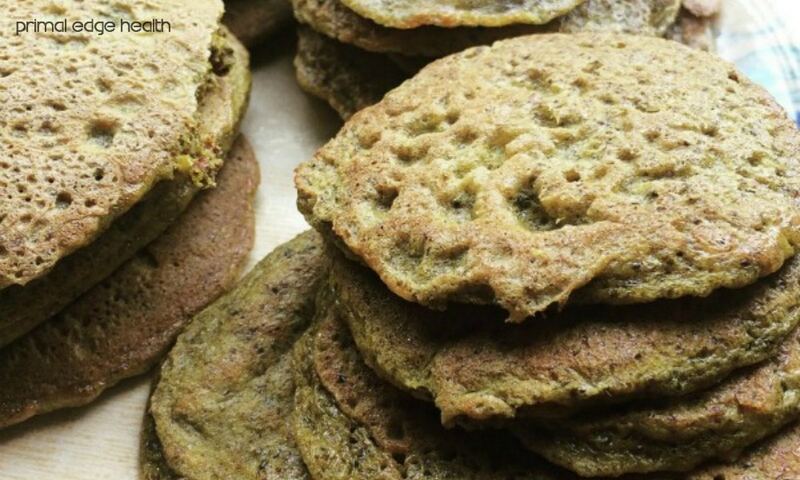 Use these flatbreads as a grain-free, gluten-free source of fiber, protein, and fats to nourish your young ones. Provide a hot breakfast in the morning or pack them into lunches. Take a mix of your favorite hamburger fixings. Make the Mediterranean Beef Heart Burger Patties or Southwestern Burger Patty (from The Ketogenic Edge Cookbook). Layer on grilled onions, blue cheese, bacon, lettuce, tomato, homemade mayo, and avocado slices. Nestle these between two flatbreads and you have yourself a legit low-carb burger. Fold the flatbread into a taco shape and stuff fill with canned sardines, minced cilantro, chopped onion, salt and a few squeezes of lime juice. Serve with avocado on the side. Cook the flatbreads, then sprinkle your favorite cheese, grated, on one half, fold over the other half and warm over medium heat until the cheese is melted. A warm quesadilla stuffed with raw, organic grass-fed A2 cheese and a sprinkling of chipotle powder. Served next to a side of guacamole and canned sardines. Take two already cooked keto flatbreads, spread a light coating of butter on the outsides and place a piece or two of cheese in the middle. Grill just like bread! Serve with a side salad garnished with oregano and olives. Pour the batter in a large single circle in a hot pan. Cook until done, then spread a marinara or pesto sauce, melt cheese, and add sauteed mushrooms on top. Slice into little pizza slices and serve warm. Prep and pack into a lunch just like bread slices. Make a large crepe sized round and fill with arugula, sprouts, mashed avocado, cucumber, and tomato. Flavor with nutritional yeast, garlic powder, and dried oregano for a delicious keto garlic bread. Mix in 1 to 2 tablespoons of sweet or spicy curry powder to the batter and cook both sides until done. A “Curried Naan Bread” with a rich golden color from ground turmeric powder. The recipes for many of these sauces and dips include additional variations, giving you even more ideas on how to enjoy these flatbreads! 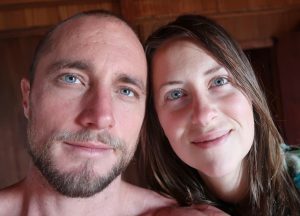 A well-formulated ketogenic diet is never boring or restrictive! 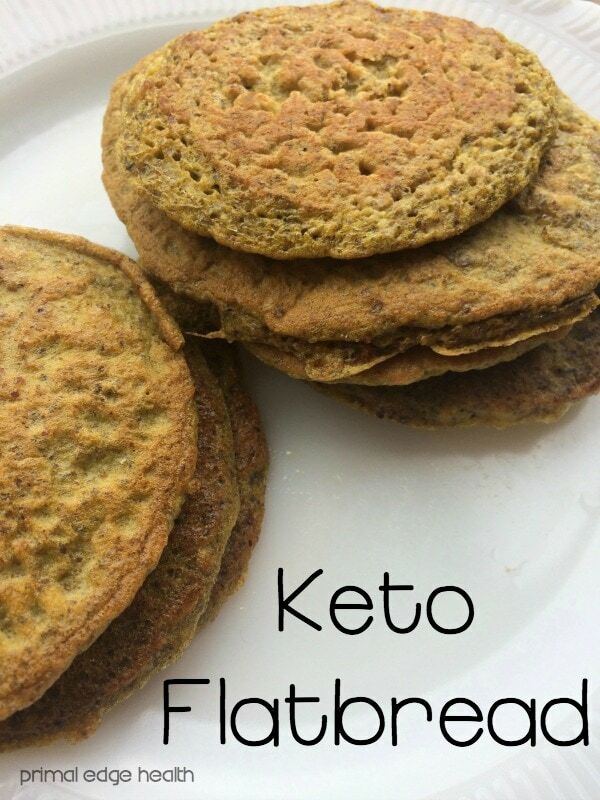 What other fun things can you do with the Keto Flatbread? 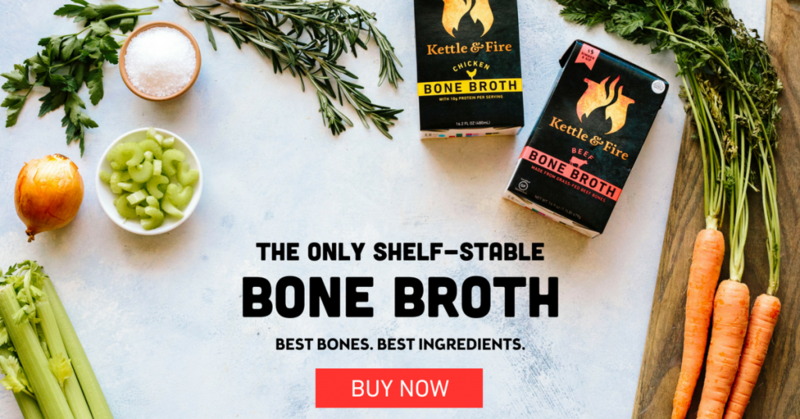 This recipe and the fact that I can adapt it to what I have (chia or flaxseed, grounded or not) is possibly the reason why keto has been easy so far. 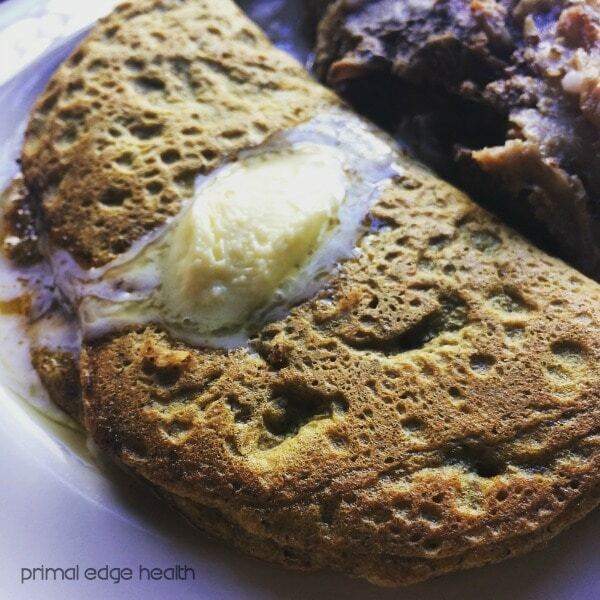 I have crazy schedules as a teacher, so I usually end up having just a sandwich… My journey to keto started with primal edge health, so I’m lucky… I’ve never felt lost. What a great combo, I’ll be trying that basil, meat, and avo next – I agree, savory flatbreads are the way to go. 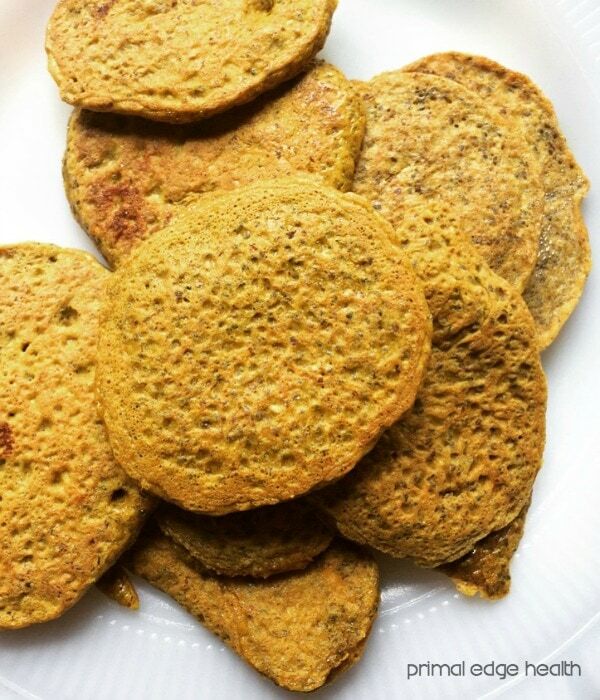 I made these pancakes this morning with about 2 TSP of Pumpkin Pie Spice and they were just great to satisfy a sweet craving (no sugar or alternatives added). I’m thrilled to find your site after about 10 weeks on low carb (under 20g a day) and IF……no weight coming off just yet…….I’m 74.4Kg but changing shape and feeling better than I have in a long time. T2D (14 years) and 70 years old, I feel better than I have in a long time and hoping to ditch my only medication Metformin in the future. Thanks for all you are doing to get sensible information and great recipes out into the world. From across the Big Pond in Australia. I just got the ingredients for this in today and it worked so well! I added lakanto and chocolate powder to the mix and made a chocolate pancake. Topped it off with lakanto maple syrup and it was awesome! All the kids wanted some. I was worried it would have an after taste from the flax but didn’t find that to be the case at all. This is a new favorite and will be replacing a lot of different bread recipes because it’s so versatile. Thanks for the recipe!!!! Awesome Paul! I’m so glad you tried it out and happy to hear it was a hit with the children too, that’s the best!